Fountain Square has long been the gathering and rallying point for Cincinnatians while it has also served as the center point for the 2+ million person metropolitan region, and it's great to report that the heart of Cincinnati is strong. According to 3CDC, estimated attendance through August 25 on Fountain Square for this summer's PNC Summer Music Series is well over 100,000 - more than double the attendance figures for last year's summer music series. 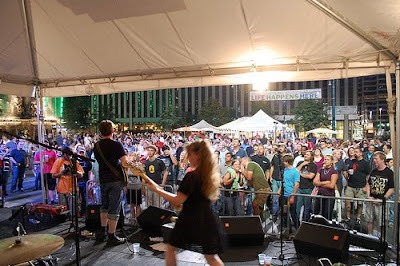 Like last year, the 2009 PNC Summer Music Series featured seven live concerts and one open mic night per week on Fountain Square. And much like last year, "Indie Summer" nights on Friday, and "Salsa on the Square" nights on Thursday were by far the most popular. There has been much more than music packing the Square throughout the summer as a weekly farmers market, movie nights, family days, cooking demonstrations and other various events have added to summer crowds. With these events an estimated 165,000 people have visited Cincinnati's primary gathering space for programmed events alone. “The quality of our programming, including some very well know bands like Bad Veins, The Fiery Furnaces and the Wrens made this year’s PNC Summer Music Series really stand out,” said Bill Donabedian, managing director of Fountain Square. Labor Day weekend marks the end of this year's music series, and many of other summer events will be ending soon too, and make way for fall events like the Oyster Festival, Oktoberfest and much more. The Friday night series closes out tonight with local favorite Kim Taylor. She was recently named by Paste Magazine as part of their Best of What's Next 2009 series. Kickoff the holiday weekend be coming out to see a local gal done good.